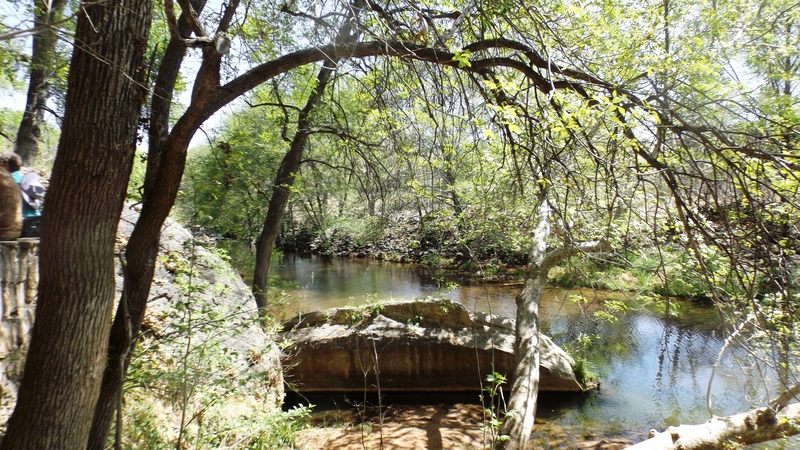 There are a couple of National Monuments very near Cottonwood, and we had to see them. 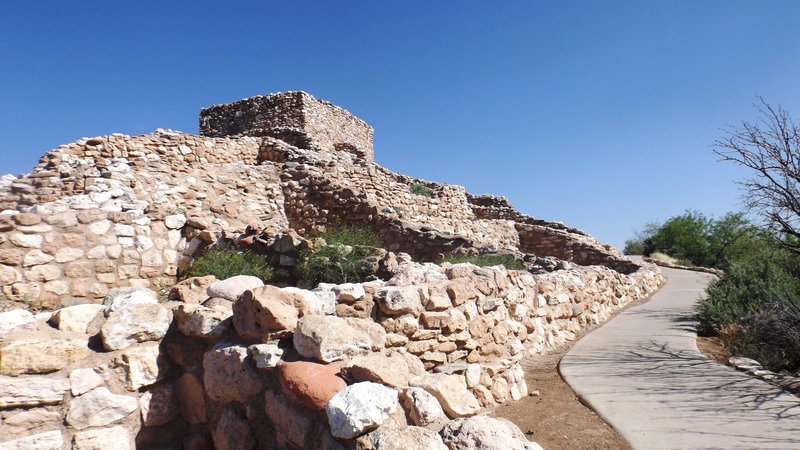 Tuzigoot is the site of an ancient Native American apartment complex which was home to as many as 200 Sinagua people. 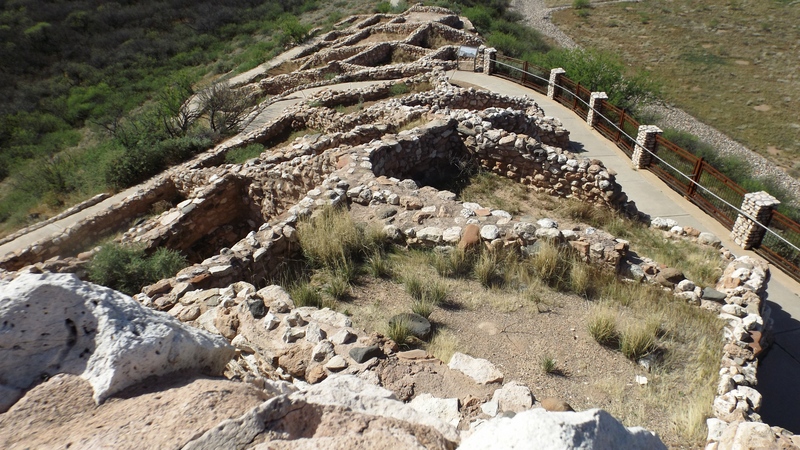 It was excavated and partially rebuilt back in the 1930’s by two American archaeologists and a team of Apache laborers. It is believed to have been continuously used between 1,000 and 1,400 CE, or A.D. if like me, it’s been a while since you studied history. 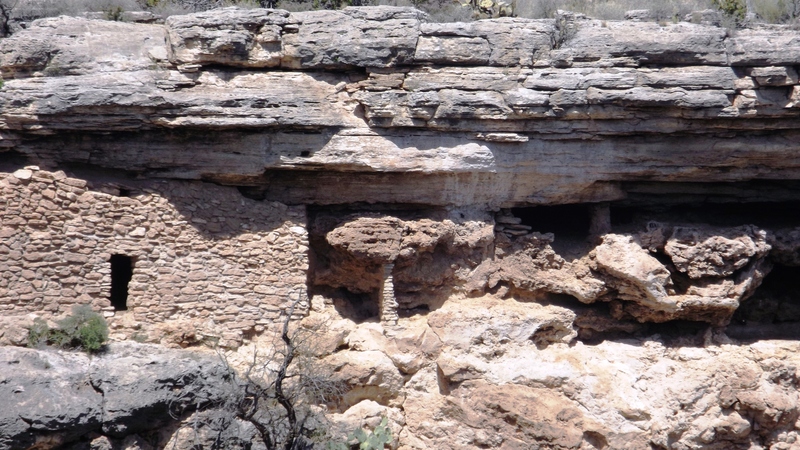 The Sinagua were early farmers who dabbled in hunting and gathering, and also in copper and salt mining. They left the area for reasons unknown to the Park Service, and most relocated further to the north and northwest. Modern day Hopis are considered to be the descendants of the Sinagua (and the Hohokams, among others.) It struck me that their proximity to Apache territory would have imperiled their survival (Apaches, Comanches, and Sioux all kidnapped children from neighboring tribes), but there is no mention of that at the Monument. The Sinagua moved before the horse came to North America, which excuses the Comanches from any blame (great cavalry!). The Apaches were mostly foot warriors; I won’t let them off the hook for the demise of those old agrarian tribes. 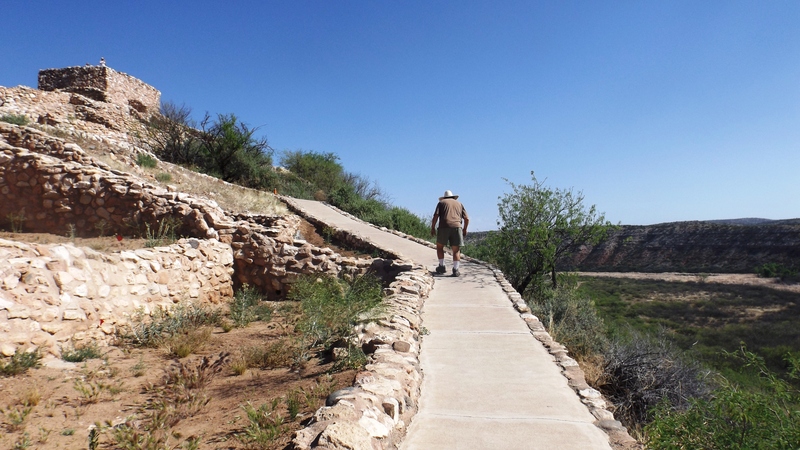 Montezuma Well carries the Aztec leader’s name because somebody who only spoke English figured he must have been here. 15th century Aztecs would have faced a difficult journey of a thousand or more miles north of their base. That’s a lot of desert to cross just to trespass on Apache turf. The water in the well bubbles out at a rate of a million gallons a day. It comes from underground rivers. The Park Service says the water that emerges today fell as rain or snow on the Mogollon Ridge, over 100 miles away, 10,000 years ago. 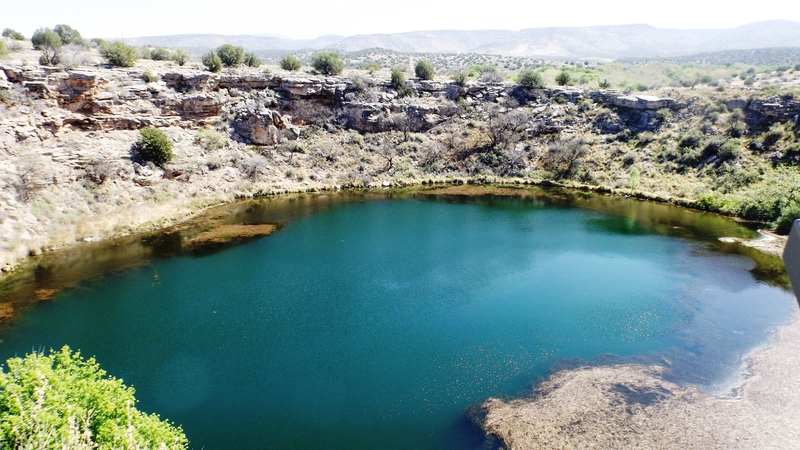 That water has been filtered through so much limestone that when it emerges into The Well, its carbon dioxide content is 600 times that of fresh water lakes. This means almost no oxygen, which means no fish. 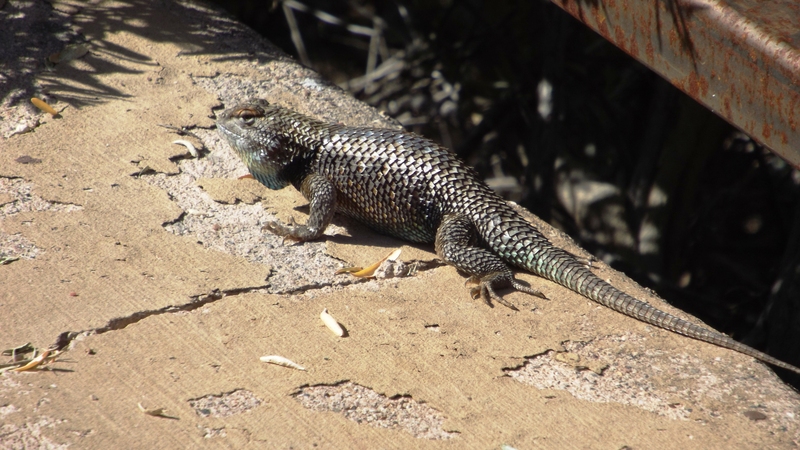 It’s a strange little food chain in Montezuma Well. There are plankton, water scorpions, tiny shrimp, and leeches. The leeches are the top of the food chain, unless ducks are around. Ducks really fancy leeches. 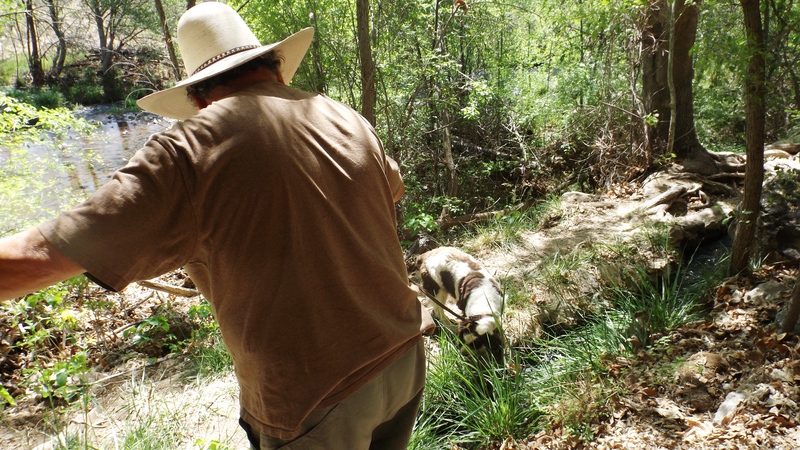 The water has a high arsenic content, which could be another reason the Sinagua left. Arsenic has been observed in all the bones around the area, but it seems only people lived long enough for it to build up a lethal dose. Hoss and Pinky. Pink fell in seconds later. It was deeper than it looked, with a strong current. Help came in time, and all is well. Nonetheless, it’s a lovely place; literally an oasis in the desert.